Are you also among those who are being targeted by Blogger Automated Spam classification System? What you could do, if some day you rose up in the morning and saw your site getting removed by Blogger Automatic Spam Algorithms. Probably, it would turn out to be a nastiest nightmare for a dedicated person who almost spends years in building his brand, so before this nightmare could become reality it is essential for you to understand the Blogger Automated Spam classification System. 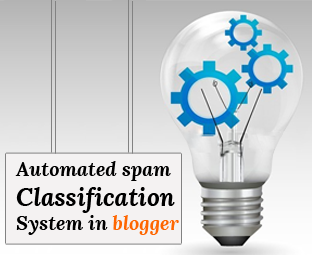 In this article, we will tell you what is Blogger Automated Spam classification System and how it works? What is Blogger Automated Spam classification System? It is an automatic Algorithm, which tracks your site for of malicious code. If it sneaks suspicious activities going on your site, it straightaway disables your website without even checking your reputation or vice versa. Since, this system is automotive, so the chances are quite prominent that it might be some false positives. (Google Say's) We're frequently working on refining our algorithms to avoid these mistakes. If you think your site is not a spam by any means, then it was one of the false positives, and we apologize. This system still needs a lot of improvement because most of the time the decision taken by this system are proved wrong. It does not check the background or reputation of a website and directly removes it without providing a proper reason. Blogger engineer knows that this system is not accurate. Therefore, they provide you a chance to file an appeal against the deletion. First and foremost you should properly read the content policy. If your site is not incompliance with the rules and regulations as prescribed by Google then, sooner or later you probably would say a good-bye to your blog. In this situation, you will not even get a second chance so keep in mind your blog’s survival is in your hands. Do not add Encrypted or unnatural code in your template unless, it is provided by a reliable source. Try to scan your site for malicious code, so that your template is free from any kind of virus that could cause problems. So, now that we have explained every bit of it, what are your thoughts, does this system is good enough to be trusted? Well, it is a conspiracy that Blogger is still carrying this sneaky luggage. When we first saw this mechanism, we did not experience any lapses and things were working pretty neatly until one of our testing sites got deleted due to some redirecting script issue. Since then, these issues are getting bigger. Almost every day we saw people shouting and screaming on Google Product forum asking the support staff to reinstate their site. Obviously, like me and you they also care about their sites. Not everyone gets a second chance only a few lucky one gets their site back. You may name it as chauvinism or favoritism, but we cannot do anything because it is the price that we pay for using this platform for free. We hope that this article assisted you in learning and understanding the Blogger Automatic Spam detection system. Let us know, what you reflect about this mechanism. bro sorry for off topic question but i want to ask that how to use both comment system g+ and blogger in blogger just like your one. We are testing things. Would release it very shortly. Stay tuned. Thaks alot bro. you have expalaned very well few days ago blogger deleted the onlineustaad.com blog without any against terms law. why blogger officials is doing thats. it will lose alot of bloggers and will shifted to wordpress. if they deleted blog without any broken law. bro i have off topic questions. Syed bro you know that nowadays there is thousands of copycats who copy our contents and publish anywhere. now i have created some css coding by which we can disable blog content from selecting except the blockquote sections. So my question is that if i applied it on my blog is there will be any issue. is there will any problem for SEO, ranking, and crawlers, i am coming backs, hope for earlier reply. Abdul Wali the Owner of that site used a malecious code in his site. He added it in the Widget Area which cause this problem. However, I am sure he would get his site back if it was not a SPAM. Yes you can use it. There is no problem whatsoever. Search engine bots actually sees your page source and from their they derive the content so you can use it without loosing any SEO. Thanks Syed Bro for your nice words...i understand we are going to apply in our blog. Actually what types of codes can cause to compel our blog for deleting. like you say that wali has used some malicious code in his site. what do you mean by thats. we have also used so many widget in our templates. so clear me which type of coding should be prevent from blogger blog. We will never use thats we dont want to lose our blog. so kindly you are requested to mentioned here. So, whether they are infected or not would not going to cause any problem. Google won't deleted or mark your site as SPAM. Read this heading "Malicious Redirecting Scripts" mentioned above. Ya that nice now i found the exact answer from MBL editor team. Syed Bro i have no special words to pay your thanks but my message will goes to MBL thats if someone want to solve theirs blogging solutions then here is a complete lab for everyone. Communicate with loyal teams. mbl is 100% replay-able blog. Bro you have done so alot for me. you have clear everythings. Best of luck & may you live long. if I may imitate you this template?? Sorry mate, its copyrighted and it is potentially illegal to replicate the same theme. Thanks mate for sharing these awesome tips, I'll always make sure i keep to it, to avoid my blog being deleted. although the copyright entirely on hold by myboggerlab?? Yep, our work is Copyrighted. However, if you want to order a Template. We would provide inf act better theme.